“Once more I have escaped from filth, fleas, rattlesnakes, hills, mountains, rocks, and rivers,” wrote the fatigued Methodist Bishop, Francis Asbury, after traveling through Mills Gap in 1801. Traveling the mountains in those days wasn’t merely treacherous; as Asbury discovered, it could be terrifying. The so-called roads cutting through the gorges and across peaks were nothing more than Indian trails or paths left by wild animals, such as the buffalo that once roamed the Highlands. These routes may have worked for hearty trappers and frontiersmen, but for homesteaders and folks moving goods to market, traveling from summit to summit was a case of you can’t get there from here. In April 1792, when the first Buncombe County Court met at the house of Colonel William Davidson (near the present entrance of Biltmore Estate), the men were ordered to remove their coonskin caps before discussing their first order of business: roads. By this time, the mountains were witnessing a slow but steady growth in population. The foothill slopes in Tennessee and North Carolina had become major areas for raising livestock, particularly cows, sheep, and hogs. In May, the livestock was turned loose in the grassy meadows to feed for the summer. Beginning in October, the animals were taken to market, driven east on hoof to the more populated cities on the coast. In 1819, the General Assembly created a Board of Internal Improvement to build roads in the western highlands for the improvement of trade and regional growth. One plan called for a road linking Charleston, South Carolina, with Asheville. Another, the Buncombe Turnpike, would follow the French Broad River and connect Greenville, South Carolina, to Greeneville, Tennessee. Also known as Drover’s Road and the Old State Road, the 75-mile Buncombe Turnpike was completed in 1827, and was considered the finest route in all of North Carolina. As a so-called “first class” toll road, it was 12 feet wide (third class roads only needed to be wide enough for a horse and rider), had a dirt and gravel surface, and began near the South Carolina state line. It then cut through the Saluda Gap to Flat Rock and Hendersonville, then on to Asheville, where it followed the banks of the French Broad westward into Tennessee. There it joined with the Tennessee Road, which connected the region to Kentucky. The Buncombe Turnpike brought an unprecedented boon to the local economy. Farmers used the road to take their produce to market, and it was a godsend for the drovers. It saw heavy traffic. An estimated 150,000 hogs were driven in one season. A bevy of support services sprang up to accommodate the drovers, who needed to be fed and put up overnight, as did the livestock. Farmers prospered because the drovers needed whole wagons of corn to feed their stock. Counties abutting the turnpike produced almost twice the amount of corn grown in other areas, making it the region’s first cash crop. Another important offshoot was the establishment of roadside inns called stock stands. Much like motels, they were easily accessible and generally located about 10 miles apart, since a full day’s travel for a herd was between six and 20 miles. They did brisk business during the fall. One stand keeper, David Vance, father of Governor Zebulon Vance, boasted that he fed 90,000 hogs in one month. Hezekiah Barnard bragged that he topped Vance by feeding 110,000 hogs at his stand during the same period. Perhaps more than anything, the opening of the turnpike helped launch Asheville and the surrounding region as a resort area. Stagecoaches carried visitors to the cool mountain climes for the summer without the raw adventure encountered by Asbury. While the turnpike was used until the 1880s, the arrival of railroads in the late 1860s marked its decline. 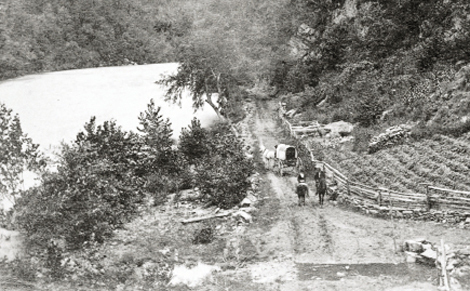 Yet for more than half a century it had served as the main route of transportation through the highlands, a true road to prosperity for Western North Carolina.